Pothashang News Service: Imphal, June 18, 2018: The flood situation in some parts of the state is improving although some areas are still inundated under flood water. The government of Manipur is using all its machineries towards extending maximum help to the flood victims and is keeping a strict vigil to control the situation both in the hills and the valley. The government on June 13, 2018 announced holiday on account of the sudden flood in the state which has affected large number of people both living in the valley and the hills. As per the directorate of Relief and Disaster Management, all together 51,689 victims from different flood affected areas were evacuated till 4pm this evening. Altogether 174 relief camps with 59,170 inmates taking shelter were opened providing assistance and distributing relief materials including essential commodities like rice, dal, edible oil, candle, mosquito coil, match boxes among others. Central and state forces were deployed for immediate assistance of the victims. The total number of locality/community/village affected by the flood is recorded at 304, while 23,456 houses were damaged. The flood claimed 7 lives and one person is still reported to be missing. The flood has also claimed lives of 400 animals and damaged 3,947 hectares of agricultural land. 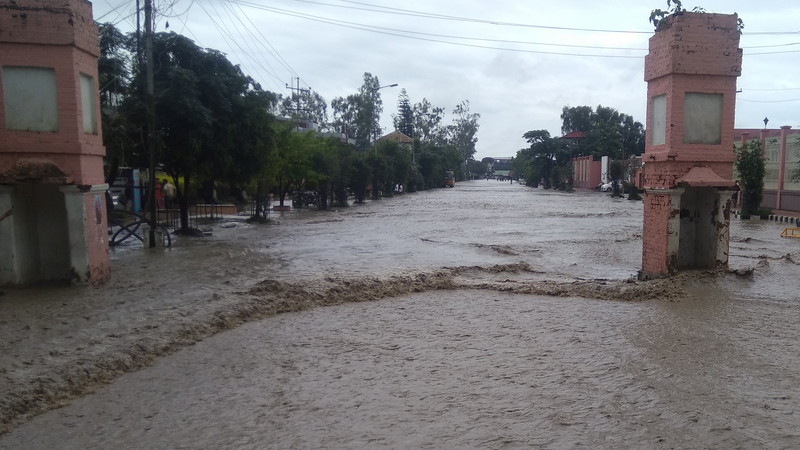 Following the incessant rainfall in the past few days, several parts of the valley and hill districts of Manipur viz; Imphal West, Imphal East, Thoubal, Bishnupur, Kakching, Kamjong, Jiribam, Churachandpur, Pherzawl and Kangpokpi were affected. During the current monsoon season, 1,80,102 were affected in the above 10 districts of the state. As per the information available from the DC concerned, the total population affected in Imphal West was 67,000, Imphal East – 1 lakh, Thoubal – 32,890, Bishnupur – 20,000, Kakching – 700, Jiribam – 1800, Pherzawl – 500 and Kangpokpi – 5,000. Houses damaged recorded in Imphal West were 13,000, Imphal East – 1,500, Thoubal – 5,980, Bishnupur – 2,042, Kakching – 160, Jiribam – 382, Pherzawl – 44, Churachandpur- 334 and Kangpokpi – 14. The number of persons evacuated in Imphal West are 506, Imphal East – 20,000, Thoubal – 29,900, Jiribam – 1500, Pherzawl – 220 and Kangpokpi – 14. The number of relief camps opened in Imphal West – 52, Imphal East – 79, Thoubal – 24, Bishnupur – 10, Kakching – 1, Jiribam – 6, and Kangpokpi – 2. Inmates in the relief camps were recorded as in Imphal West – 6,800; Imphal East – 51,000; Bishnupur – 800; Kakching – 150; Jiribam – 628 and Kangpokpi – 56. The total crops area affected (in hectres) includes, Imphal East 3,500; Thoubal 113, Kakching 195; Jiribam 114 and Pherzawl 120. Due to the flood, infrastructure damage of 2 wooden bridges, 9 RCC bridge (4 partial damage), 2 RCC culvert, 110 kms road and 4 market sheds were also recorded. In Imphal East district, out of 10 Assembly Constituencies, 9 ACs are severely affected by the recent flood in the district. This covers all 3 sub-divisions of Porompat, Sawombung and Keirao Bitra. The flood affected a total of 15,000 households with approximately 1 lakh population. So far, Imphal East District Administration has opened around 79 numbers of relief camps, including 62 flood relief camps and other sheltering camps at safer spots in the district. About 20,000 persons were evacuated and 51,000 persons are sheltering in the relief camps. A total of 1,500 houses were damaged by the flood and about 3,500 acres of crop areas were affected. Besides, inter village roads were also damaged. The Imphal East District Administration has distributed relief materials to the affected households like rice, dal, salt, edible oil, mosquito repellants, candles, tarpaulin, among others. So far, 2,000 quintals of rice, 400 bags of dal, 15,000 packets of salt, 15,000 bottles of edible oil, large numbers of mosquito repellants, candles, among others have been distributed to the flood affected families. In addition to providing relief materials, various medical/health camps have been conducted in close co-ordination with state health department with its branches located in the district. Health camps conducted so far include severely affected villages under Heingang, Thongju, Kshetrigao, Keirao, Andro ACs. In Imphal West district as of today, the flood had severely affected Wangoi and Mayang Imphal Assembly Constituencies especially in Samurou, Yumnam Huidrom, Karam Makha Leikai, Lilong Haoreibi, Uchiwa, Top Siphai, Laphupat Tera, Komlakhong, Phubakchao, Wangoi Makha Leikai, Wangoi Longjam Leikai, Wangoi Waheng Leikai, Bengoon, Hiyangthang Palak and Naren Chaprou. More than 1,500 quintals of rice were distributed to the people affected by the flood. Out of the 52 relief camps opened, 15-20 relief camps are still functional. The flood situation in some parts of Imphal West district has improved including Patsoi and some areas in Takyel Khongban, Lamphel and Tarung. In Kangpokpi district, 3 relief camps at Kalapahar High School, Songpekjang Community Hall and Uran Chiru Community Hall are providing assistance to 58 inmates in the camps. Wooden Suspension Bridge river between Keithelmanbi of Champhai sub-division and Molvom area of Saikul Sub-Division was washed away by the Imphal river. Suspension Bridge of Haimol village of T-Waichong sub-division was washed away by Tuilang river. Chalwa Bridge, Khollen Bridge and bridge between Sapormeina of Saitu Gamphajol sub-division and villages of Saikul sub-division are weakened. Bridge of Loibol Khunnou village under Bungte- Chiru sub-division was damaged. PMGSY road of Loibol Khunnou village under Bungte- Chiru sub-division was damaged by landslide. Newly constructed PMGSY road along with number of bridges between Toribari and Haipi village of Kangpokpi sub-division were damaged. IVR bridge at Loibol Khunnou village under Kangchup Geljang sub-division was damaged. Defence teams of Army/Indian Navy/Airforce, Paramilitary forces, Engineers of Assam Rifles, teams of SDRF and state Police are also actively taking part in the relief and rescue operation. Twenty-four medical camps are providing immediate medical assistance to the flood affected people in the state.